The Pirates throw a great party at Lakewood Playhouse! When I was in fourth grade at Holy Rosary School, my sister Pat was one year ahead of me. Her teacher, Sister Stanisia, was teaching them Gilbert and Sullivan songs, including selections from H.M.S. Pinafore. I was fascinated by the unusual words, the rhythms, and the irony, “. . . I polished that brass so faithfully that now I am the leader of the Queen’s Navee.” It made me laugh out loud. Someone making fun of unqualified people being appointed to positions of power was nectar to my rebellious soul. When I was in high school, the St. Leo’s and Aquinas girls and the Bellarmine boys were staging The Pirates of Penzance. I went to a presentation and was hooked. The organized silliness and lovely songs became a fond pursuit. G&S are the precursors of Spamalot. 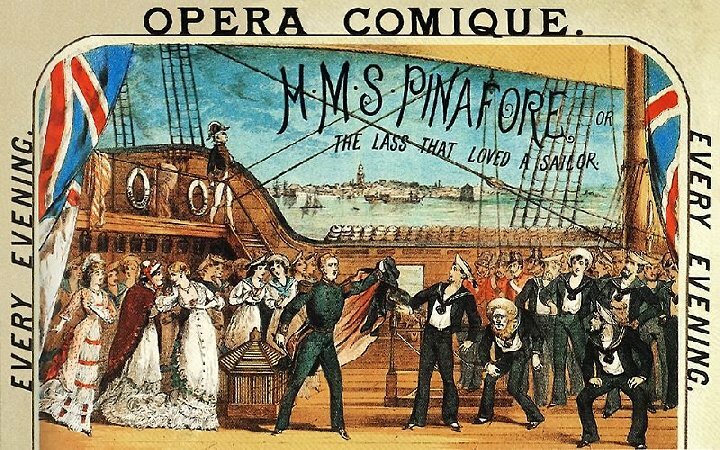 After we were married, we found VHS tapes of the D’Oyly Carte Opera Company, the original company that producer Richard D’Oyly, Gilbert and Sullivan formed to present the operettas. They were still funny, but the D’Oyly Carte’s staging was so stiff as to seem carved in stone. Besides that, most of the cast members seemed too old to play the parts. Later we found a Canadian staging of The Mikado on CBUT. It had the full juicy funniness of G&S and it was not a bit stiff or stodgy! I bought a book of the operettas’ lyrics. That and a series of recordings of the plays cemented me into the G&S pantheon’s fans. While listening to those, I heard Trial by Jury, the first collaboration of the two. That play featured (“. 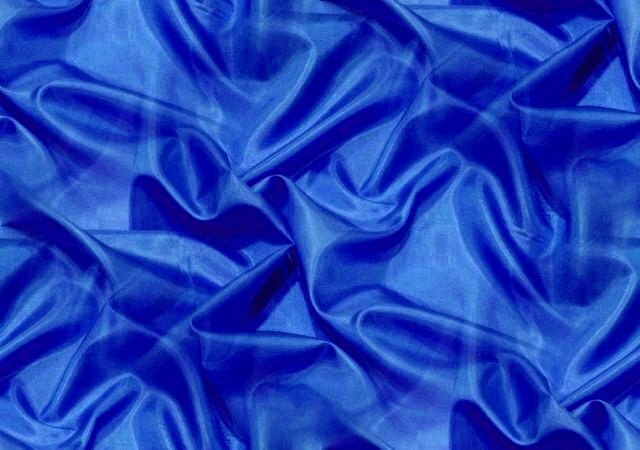 . . a trial of a breach of promise of marriage”). Before the trial begins, the judge sings a description of his path to judgeship. He was ambitious and became engaged to the “elderly, ugly daughter” of the chief justice. 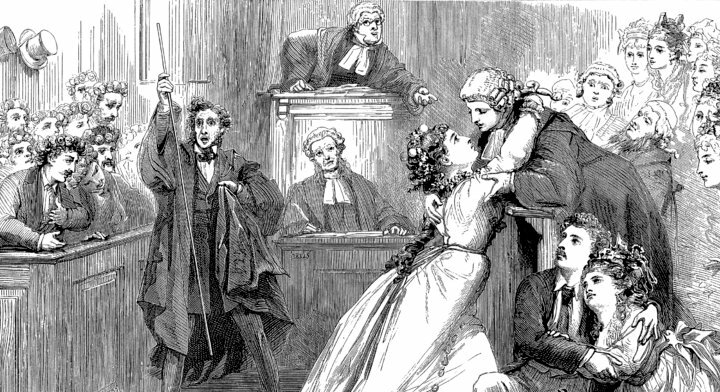 Her father promoted him in the court hierarchy and then, when he figured that he was safe, dumped the daughter. He was guilty of the same charge the defendant was charged with. He is completely sympathetic to the fair maiden who brought the suit and ends up saying he’ll marry her himself! A pivotal moment in my Pirates experience was when Mom and I went to the 5th Avenue to see a production. Jim Belushi played the Pirate King. He practically genuflected during each step of his dramatic entrance. 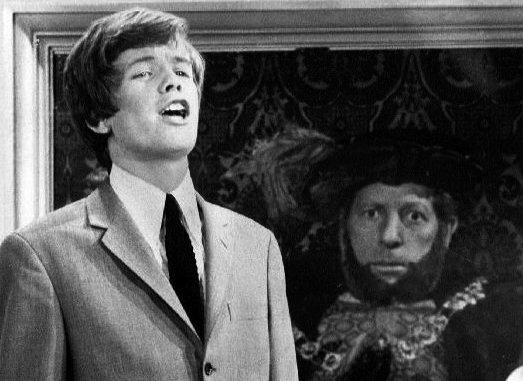 Peter Noone, formerly of Hermit’s Hermits, was a fine Fredric. The professional theater experience is so powerful and pleasing. We came away singing snatches of the songs as we made our way to the Amtrak station to come home It’s a treasured memory, both because it was the Pirates, and because it was so long ago. My mother died in 1985! I was so pleased to see that Lakewood Playhouse was mounting the Pirates, my first love. We’ve seen many productions of their hilarious plays, in Seattle, at the G&S Society, and around the Puget Sound. 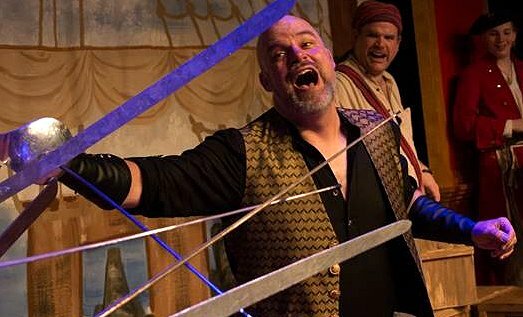 John Munn, the Artistic Executive Director, directs and plays the Pirate King. He was able to dance, do slow motion mugging, sing and look aghast again and again. The set employed a walkway, excuse me, a dance-way, into performance area, with a space in the middle for the three musicians. The back of the stage had a grand pavilion that had painted curtains that delineated the wharf, the beach, the ruins of the grand buildings the Major General had bought. It was wonderfully clever. There was even a silouette portrait of Queen Victoria over the proscenium. The pieces of business were so precise, with the daughters’ parasols, the pirates’ weapons, the major general’s metals sash and his crop, and the policemen’s trungeons were expressive. The costumes were very nice, from the daughters’ dresses and nightgowns, the Major General’s white jacket with pith helmet, the pirates’ motely dress (after all they are pirates) and the policemen’s uniforms, really brought the characters to life. The voices, the voices – they were so strong and vibrant. The men’s baritone and bass as well as the daughters’ lithe and nimble soprano voices added depth and determination to the production. The harmonies were to die for. I was entranced from the first pirate note. 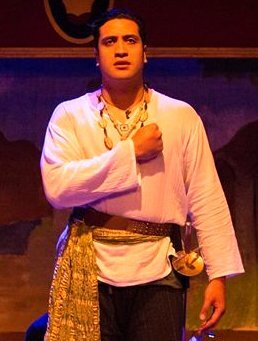 The company's Frederic was played by Fune Tautala, who made his first appearance in his home town after going through Eastern Oregon University's theatre program and two seasons with The Oregon Shakespeare Festival. He is a nice addition to our community with a much better voice than Peter Noone. Slapstick, boisterous dancing, extravagant flirting, the lovers’ longing, vigorous action and great voices in harmony made this a production of note. The actors and musicians were having so much fun the audience couldn’t help have a good time, too. I enjoyed every minute of it. Now I’m waiting for the next place that G&S will be staged. To read a different review of the production from a different angle, go to Young and New Pirates. 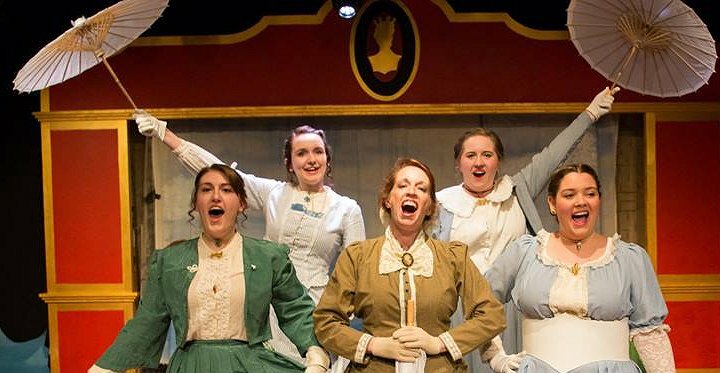 The Pirates of Penzance runs until June 25. To get tickets, call the box office at 253-588-0042, or, go to boxoffice to order. 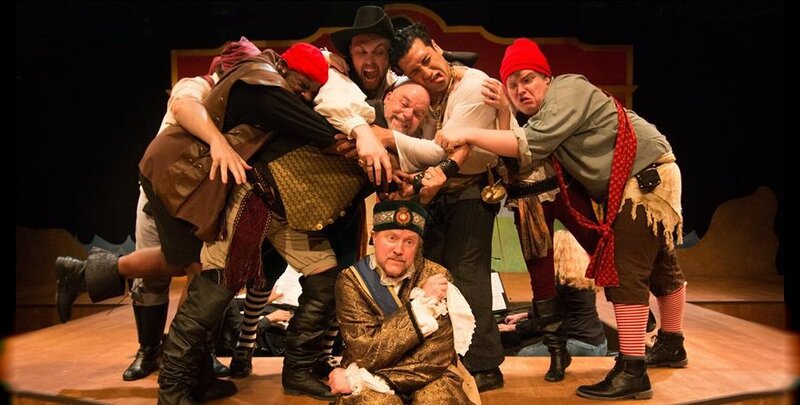 Pirates of Penzance - Lakewood Playhouse - Review - 2017, Pirates of Penzance - Lakewood Playhouse, Pirates of Penzance - Lakewood Playhouse - Review - 2017 Washington WA.